I’m back today with another handy kitchen printable. One can never have too many, in my opinion! 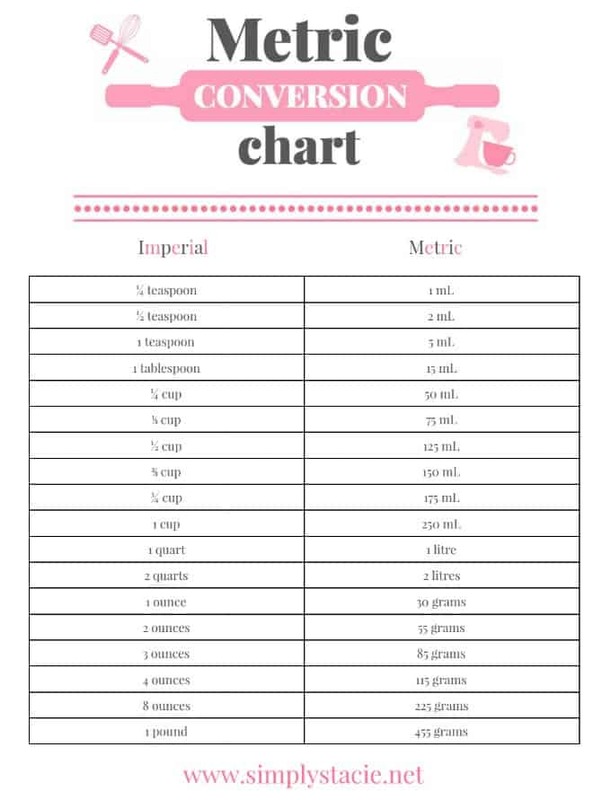 This Metric Conversion Chart printable will help you when you are preparing your meals and need to convert a measurement to either Imperial or Metric depending on where you live. I’m in Canada and tend to use both at home. Canada uses the metric system along with the majority of other countries in the world. I learned that there are only three countries that use the Imperial system: United States, Liberia and Myanmar. Who knew? I don’t have many readers in Liberia or Myanmar, but I have many American readers. Also, there are so many wonderful American food blogs that list their recipes using Imperial measurements. Print out this conversion chart and keep it in your kitchen or household binder for reference. Another tip is to use Google. Type in the exact conversion you are looking for and it will pop up. Fill out the form below to get this Metric Conversion Chart delivered to your inbox. What system do you use where you live: Metric, Imperial or a bit of both? This is fantastic! We were just talking about this yesterday. I was raised on Imperial and then mid school life everything changed to metric. Awesome!! This is so helpful. I’m terrible with conversions.